Picking the right outdoor kitchen countertop is a critical decision. The saying that a chain is only as strong as the weakest link applies to outdoor countertops. This guide will tell you the pros and cons of picking various materials for countertops. Werever Products can ship outdoor cabinetry anywhere, but we do not ship countertops. You can source your countertop locally. Any countertop company will have no problem adding a countertop to our cabinetry. For help with your countertop selection, please call us and we will give you free advice on your countertop selection. 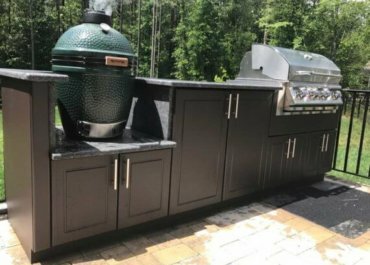 Note: If you use our free outdoor kitchen design service, you can take your plan view to a local countertop company and get an accurate quote. Werever recommends granite for your outdoor countertop. Stated simply, granite has been granite for millions of years. Your granite countertop will continue to stay granite for millions more. Plus, granite is getting more affordable with so many companies competing for your business. Tip: Expensive granite is not “better” granite. The price of granite is determined by how rare it is, or how hard it is to work with. If you go to a granite distributor, notice how some slabs have rough and irregular edges. That is because some granite while beautiful, cracks or breaks easier than others. So guess what, those varities of granite cost more. Shop by asking which granite options costs the least. If you find a color you like, great! You’re done! You can always ask to see the more expensive choices later, but why not start with something affordable first. No, no, no, no, no! Do not put laminate or formica in an outdoor kitchen. You will regret this choice. I don’t care how tough and durable the laminate is, the supporting particle board will not last. Once moisture touches the particle board, it will start to swell, and then it is all over. So do not get talked into putting a laminate countertop outside. Even if the area is covered, do not do it. You’ll regret it, and wind up buying a countertop that lasts. So save the expensive mistake of buying TWO outdoor countertops,. Just pick the right one the first time. There are several brands of quarts countertops. Brands like Silestone, Zodiaq, Cambria, and others are beautiful and durable. Companies that tell you quartz is better than granite probably make more money when they sell quartz. They will tell you that the advantage of quartz is that it does not have to be sealed like granite. While true, sealing granite countertops is not very hard. There are two disadvantages for quartz countertops. Quartz countertops cost more than granite. Quartz countertops are NOT warranted for outdoor use. Since these countertops were engineered to go inside, they don’t have UV inhibitors. Some of the colorants could fade in the sun. While many quartz countertops may work just fine outside, Werever recommends granite as the “sure thing” for your outdoor countertop for this very reason. The advantage of tile is that it can be done as a do-it-yourself countertop. The biggest mistake made when using tile for an outdoor countertop is to use plywood for the substrate. Make sure you pick a waterproof board if you are making a tile countertop for your outdoor kitchen. Do not use plywood. Tile countertops can require a ton of labor to complete. Many people underestimate the actual amount of time it will take to trim everything for a perfect fit. By the end of their project they often wish they picked a stone top to begin with. Concrete countertops are increasing in popularity. They make a great choice for outdoor kitchens. The primary disadvantage is simply finding someone that does a GOOD job installing concrete countertops. A lot of skill goes into building a good concrete countertop. If you are unhappy with your top, you may have a tough time negotiating with your supplier to do it again. Check references and examples of actual work first.